Rockland is a town located in Plymouth County in southeastern Massachusetts. It’s about a half hour drive to Boston and about an hour to Cape Cod. Rockland has access to route 3 as well as 5 routes 53, 228 and 123. For public transportation, Rockland is served by the Plymouth and Brockton bus which connects to South Station in Boston. In nearby Abington, the Old Colony commuter rail also has service to Boston. The population of Rockland is 17,489, which is down about 1% since 2000. The average selling price for a single family home in Rockland is $249,615. The average price for a condo in Rockland is $206,228. Year to date, the number of home sales has increased 10% compared to the same period in 2012. The average selling price for a home year to date in Rockland increased 1% compared to last year. What Makes Rockland a Great Town to Live In? Rockland has several parks including Jefferson Saint and John Smith Lane Conservation lands, and Reed’s Pond, a popular spot for fishing. Rockland is also home to the Rockland Golf Course, built in 1964. Rockland Golf Course is an executive-type 18 hole public facility, with one of the longest par 54 layouts in America. Rockland Golf Course runs a Junior Golf program, which offers instruction for children 18 and under. 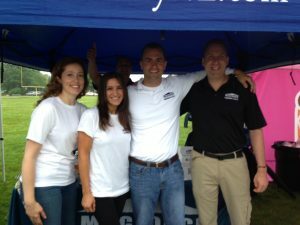 One of the sponsors of this year’s Zip Trips from Rockland is Rockland Cement Block and Flag Company. They sell many different types of items for the home such as garden accents, landscaping supplies, and flags. Rockland is also home to The Crop Shop, a popular scrapbooking and craft store that carries a wide variety of supplies as well as classes in scrapbooking, card-making, as well as kids’ classes and birthday parties. For dining out, residents of Rockland enjoy going to Bella’s Restaurant, open since 1973 which serves authentic Italian cuisine as well as seafood, meat, pasta entrees and pizza. Another favorite is The Banner Pub, which is also a bakery and deli. The Banner features sandwiches, desserts, and their own smoked meats. Players Sports Bar and Grill is a family friendly restaurant with great food and a special menu for kids. Players has something for everyone, from trivia to open mic nights, live music, sports and special events. The Rockland School public system consists of Jefferson Elementary, R. Stewart Esten Elementary, and Memorial Park Elementary Schools. Students in grades 6, 7 and 8 attend John W. Rogers Middle School, and students in grades 9-12 attend Rockland Senior High School. Rockland’s parochial school, Holy Family, serves students from grades K through 8th. Do you live in Rockland? Tell us what you like most about Rockland or send us your photos!